Evo-Stik is a globally recognised provider of adhesives and sealants for both domestic DIY and trade use. Their large and diverse product range has grown over the years from the single impact adhesive developed in Stafford in the 1930s. This original Evo-Stik impact adhesive was initially developed for the shoe industry but is now considered to be one of the more influential products that helped revolutionise the DIY industry. It has been a firm favourite amongst DIYers since the 1970s and 1980s, due to its ease of use and its effectiveness. 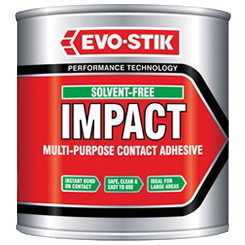 In fact, Evo-Stik is still the UK market-leading impact adhesive today! The expansion of the Evo-Stik brand has resulted in a large range of adhesive and sealant products being developed for the construction industry, including the professional flooring and insulated glass sectors. The range of Evo-Stik adhesives and sealants for the DIY, trade and stationery industries is huge, including repair adhesives for wood, plastic, metal or just about any material that you can think of, as well as epoxy adhesives, grab adhesives, tiling and grouting materials and sealants for builders and decorators. Evo-Stik has a solution for every conceivable situation where adhesives or sealants are required. Browse our range today.